Beaty DESERVES a 5 Year EXTENTION!!!! Beaty and his Birds broke a 49 game road losing streak!!! It was a decisive win! If he gets another win in pre conference, make it 10 years. If he goes .500 for the season, then give him tenure to 65! What exactly would the basketball program do with more money? The program is not only self sufficient but generates a profit. The football program is not only self sufficient but generates a much larger profit than the basketball program. These two programs support all the other sports programs at KU and if you eliminate football you would have also do away with most of the other programs since none is even self sufficient let alone produce a profit. I haven’t followed football closely. Can someone explain to me what’s up with this Pooka Williams kid and why he almost didn’t play? @jaybate-1.0 46. 49 is the all time record held by Idaho State. @JayHawkFanToo KU football doesn’t currently generate much higher profits than basketball. They’re actually pretty equal at this point in time and that’s the problem. KU basketball is generating at it very near maximum profitability while KU football is nowhere near its ceiling of profitability. A good KU football program can generate probably double what the basketball program does as far as profits go. @JayHawkFanToo interesting. thanks for this. Is this 2017? Where’d you find it? 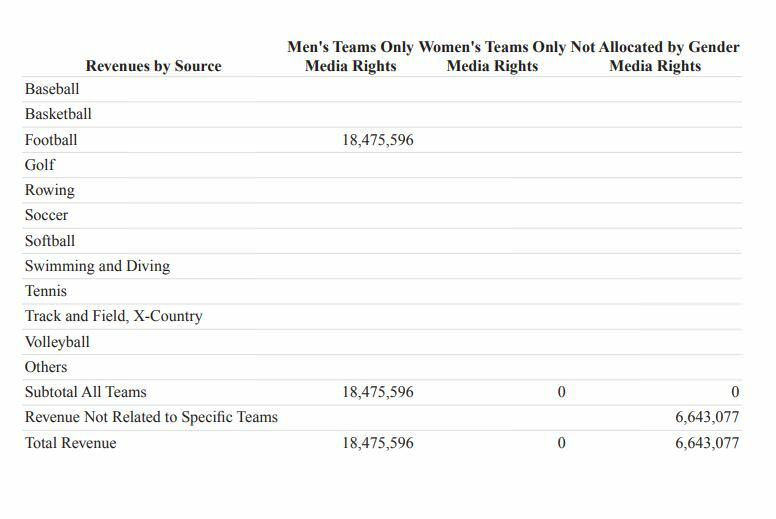 So football outperforms basketball on media rights alone. Perverse. Football has more a ton more money it in, that’s why it’s important to be good in it. @jaybate-1-0 Its like that professor after last week saying we should cancel the program and give the money to students, it’s the little sports that cost the university more. It’s just a little silly for someone that educates people to shoot his mouth off at stuff they obviously have no idea about. “it better to be thought a fool, than to open ones mouth and remove all doubt” - Abe Lincoln. Even with as bad as the football program is it still makes lots of money. Imagine what a powerhouse KU could be with a successful football program. 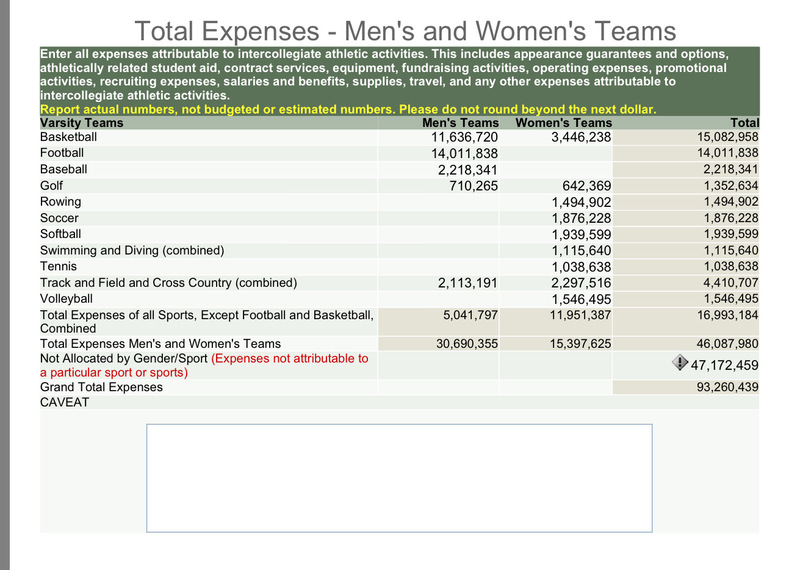 Another interesting note is how much more the basketball program spends per player, about 6 times what the football program spends per player. I guess those new digs are expensive. Just between you and me; those numbers don’t give me any more confidence than a US Forest Service budget, or a DOD Pentagon budget. Is there an expense item for a sinking fund to cover class action suits for the possibility (probability?) of early onset brain damage in the later lives of all football players? Being in a P5 conference is what allows KU to make money on its football program. A similar quality program in a small conference would make almost nothing, and could actually cost the university money. 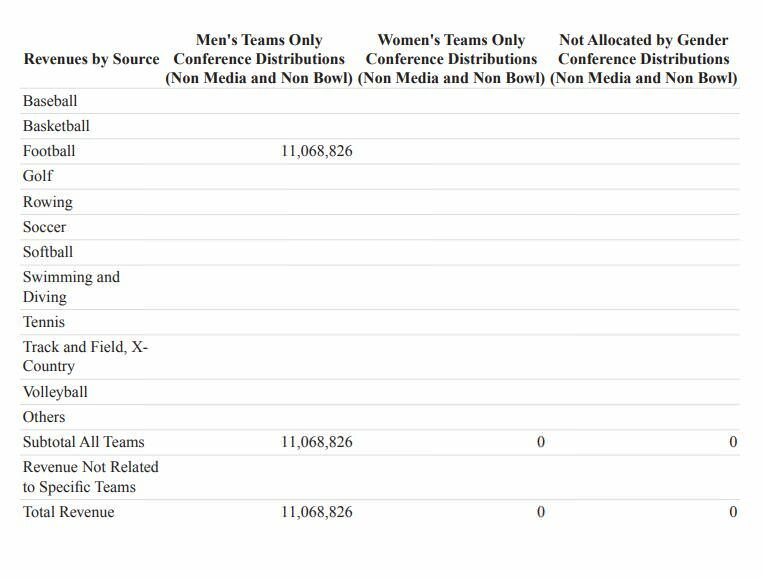 The basics of football are this - If you are in a P5 conference, your football team makes money because the playoff guarantees so much money to each conference, regardless of whether your team makes a bowl or not. The additional bowls are just gravy. If you are in a non-P5 conference, its important to make a bowl at least every few years to offset the costs. Perennially bad smaller conference teams can lose money. At KU, you notice that basketball ticket revenue is much more than every other sport. This is largely because, with such a poor football program, KU isn’t selling out its small stadium, while every basketball game is a guaranteed sellout. Meanwhile, at most other schools, if football is coming close to filling up the stadium that will always trump basketball revenue. KU can have about 17 home games in basketball. That means KU can see a little over 260,000 tickets for basketball in a single regular season. If KU were filling up 50,000 seat Memorial Stadium every game for six home games, they could sell about 300,000 tickets. That means if KU were at about 85% capacity in football, they would come close to equaling basketball ticket sales. If KU were at 90% capacity, they would surpass basketball ticket sales, and likely revenue as well. Add in concessions, parking, etc. and you see why football generates the revenue it does. You are still clueless. Basketball is pretty much maxed out in term of revenue while football can increase revenues manyfold with a decent program. You are still clueless. 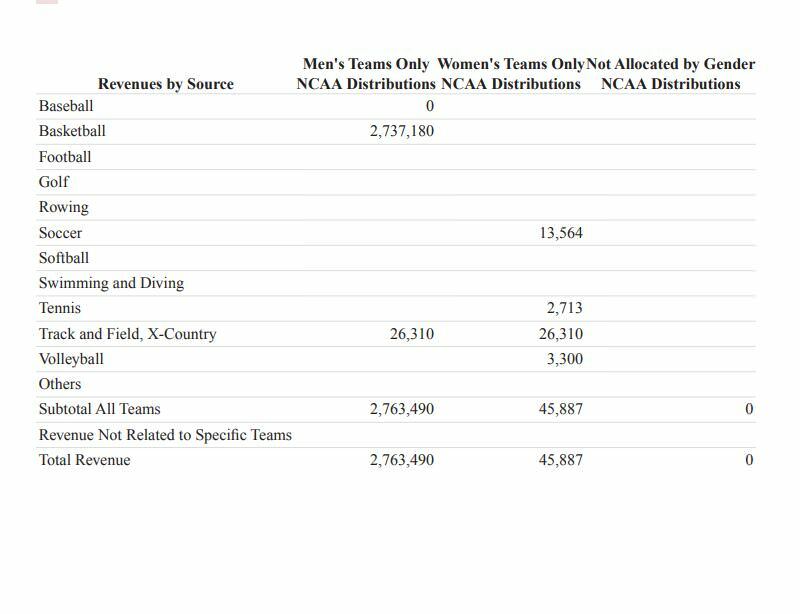 Basketball is pretty much maxed out in term of revenue while the football team can increase revenues manyfold with a good program. Your unsupported, magical assertions about KU basketball revenues are NOT persuasive. KU Basketball revenues are maxed out? KU could easily build a 50-100k seat basketball arena of the kind the NCAA Carney uses and charge double what is charged now per seat and charge corporations 5-10 times times more per corporate boxes on 10 maybe 30 times the boxes for KU basketball. Pay per view could be jacked way up. Hell, they could have the silly, pathetic, brain damaging football team play in the same arena. KU apparently exploits its hapless football program and archaic stadium, so as not to have to make the changes in KU basketball I described above. It’s an internal subsidy, don’t you get it? …and apparently you were born so long ago that senility has already kicked in. KU could easily build a 50-100k seat basketball arena? How many time must you jump the shark? First, AFH, the cathedral of basketball will never be replaced. Second, where would you get 100K to attend a basketball game for every game at double of what is charged now? The largest per game audience in college basketball is Kentucky at 23, 461 which is less than a sellout and Lexington where Rupp Arena is located has a population of 340,000 and its own metro area of over 600,000; in comparison, the population of Lawrence is 87,000. The second largest per game attendance is Syracuse with 21,000 which fills only 60% of the Carrier Dome capacity of 35,000 and the city population is twice that of Lawrence and its own Metro area id 660,000. The attendance for the 2018 NCAA Final game was 67,000. The largest attendance ever for a college basketball game was the so called “Basket Bowl” between Michigan State vs. University of Kentucky in 2003 which was held at Ford Field in Detroit and had an attendance of 78,129…do you see the trend? Wait, wait, wait, I know where you can get 100k attendance for every home game at twice the cost…planet Jaybate. I know you live in California but you need to quit hitting the bong. @JayHawkFanToo everyone in Cali smokes dope? Even if KU increased the capacity at AFH from 15,300 to 20,000 (not advocating for this, just playing with numbers) and increased from 17 home games to 18, that would lead to an increase of 100,000 tickets over the course of the season. That would create roughly $5M in additional ticket revenue over the course of the season. And that doesn’t consider the cost of either replacing AFH or increasing the capacity in some other way through a remodel, etc. KU’s basketball program makes about as much money as any college basketball program can, particularly since most of the revenue generated from apparel sales can be drawn from the basketball program. 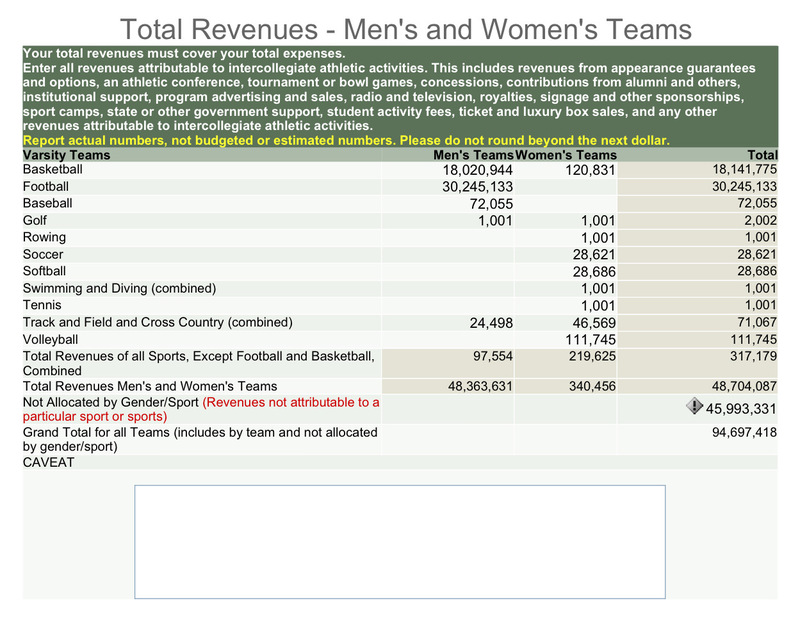 If the basketball revenue isn’t tapped out, it is very close. The football team could make quite a bit more in ticket revenue, and in bowl revenue. That right there would surpass the $5M increase from remodeling AFH, and that’s without making any investment in new facilities. Not everybody does it but I did not say that either, right? BTW, pot is readily available in California. Do you really think that KU would One - replace AFH? and Two - build an arena with over 4 times the capacity of Rupp, the current leader in attendance that does not even sell out with what many consider one of the more loyal fan bases in college basketball and located in a market area several time larger than Lawrence and with capacity 20K+ larger than the largest attendance for a college basketball…ever? It is so far off the realm of reality that drugs would seem like a valid explanation. Can you come up with better one? @JayHawkFanToo That was the basic premise of my original comment was that football was nowhere near its ceiling for generating revenue. I didn’t realize just how big the football revenue was worth under the new media deal. Under the old one, football was about $3-4 million per year more than basketball if I’m remembering correctly. Yep. Football has huge untapped potential while basketball is pretty close to maxed out. In terms of percentages, I would say basketball at KU is probably at 90%-95% potential. Football is probably around 50%-60%. 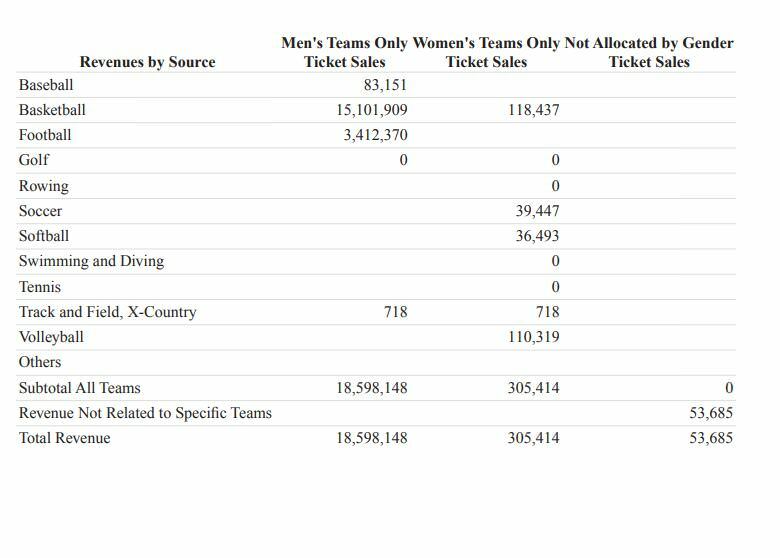 So if basketball is 90% capacity in terms of revenue potential, that means basketball could potentially earn $20M or so (about $2M more). I think that matches up well with the numbers from earlier that I estimated. Football, if it’s at 60% potential revenue, could earn $20M more, or roughly the maximum that basketball could earn. If football maxed out, it would be like adding another KU basketball program to the athletic department. Agreed. Any one that thinks the KU football program should be eliminated really does not know much about KU or college sports.